Married for 20 years. Lived in Germany where husband was stationed with Air Force. Lived in the Portland area since 1974. Retiring from Wells Fargo after 36 years. Owned a Travel Agency for three years and traveled quite a bit - my passion. Lynn Roberts Hellis has a birthday today. Lynn Roberts Hellis posted a message. New comment added. I remember English as well with you. We had an older, single lady as our teacher and I remember how you used to greet her, take her arm and kiss it. I have never forgotten or laughed so hard in my life. I also fondly remember your Dad. He knew if I came in for meat it was always going to be a Spencer! I remember spending so much time with your parents and grandmother. I remember not only hiding pennies but hunting for them as well. Wish I had known you were here in Portland. In September I am moving back to the Valley - North Albany. Hoping to find some more of our class there. Lynn Roberts Hellis added a comment on her Profile. Lynn Roberts Hellis posted a message. Hope you had a Happy Birthday. Have fond memories of your Dad - Mom always sent me down to pick up meat for dinner. She always knew I would return with Spencer Steaks (Ribeye). He was always so kind to me. Glad to hear all is well with you. In fall I am moving back to the Corvallis area - Albany Heights. Would love to see you again if you are in the area. 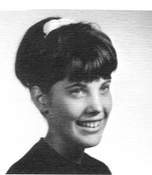 Lynn Roberts Hellis updated her profile. View. I really enjoyed visiting with you at the reunion. Wish we had more time. My Mom passed this past April at age 98. Longevity in that generation, for sure. Would love to hear more from you - keep in touch! I also remember hearing about Kennedy in English Class. Also how you always kissed our teachers hand and made her giggle and say "oh Robert!" Hope you have kept that wicked sense of humor! !